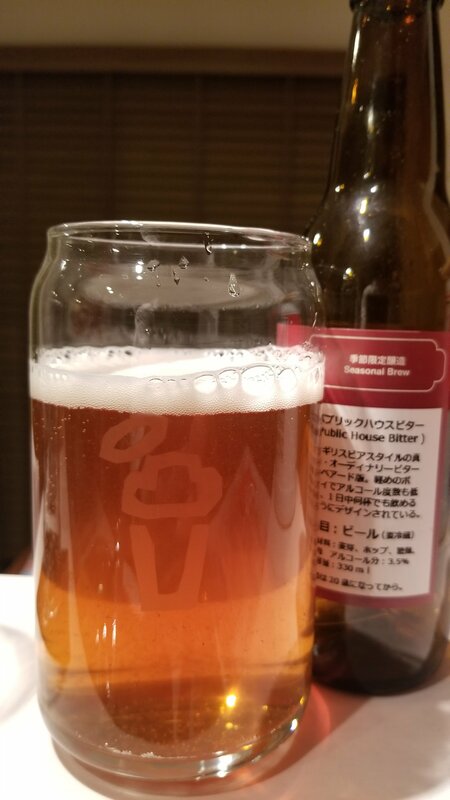 Baird Public House Bitter is a 3.5% English bitter from Baird Beer, based in Shizuoka, Japan. It’s part of their draft, which can be found on hand pump at their taprooms, and also saw a limited bottle released. Baird Public House Bitter is made using Maris Otter and Caramel malt, East Kent Golding and Fuggle hops. Baird Public House Bitter poured out a slightly lively orange brown colour with a decent amount of white head on top, though it faded fast to leave a few bubbles around the side of the glass. There was a caramel, malty aroma coming off of it, with some hints of earthiness from the hops coming through. It was quite light in the aroma front, though most English bitters are. There was an initial subtle bitterness to Baird Public House Bitter, with a light smattering of caramel going on in the body too. Baird Public House Bitter wasn’t highly carbonated either, and with the (relatively) low alcohol too, this beer would be perfect for a session on. Did you read that beer drinkers?! Session beers are about 3.5 to 4% – noone needs a 6% “session” beer. Baird Public House Bitter had a lingering diacetyl edge that wasn’t overpowering but did suit the style. It finished off with a slight noble buttery edge, though that faded fast. Baird Public House Bitter isn’t going to blow you away in terms of flavour or alcohol but it is a faithful representation of a British style of beer.